Andrea, the kids and I drove to Los Alamos, New Mexico last friday morning to visit my parents, who live on North Mesa, and to attend my 20-year High School reunion. 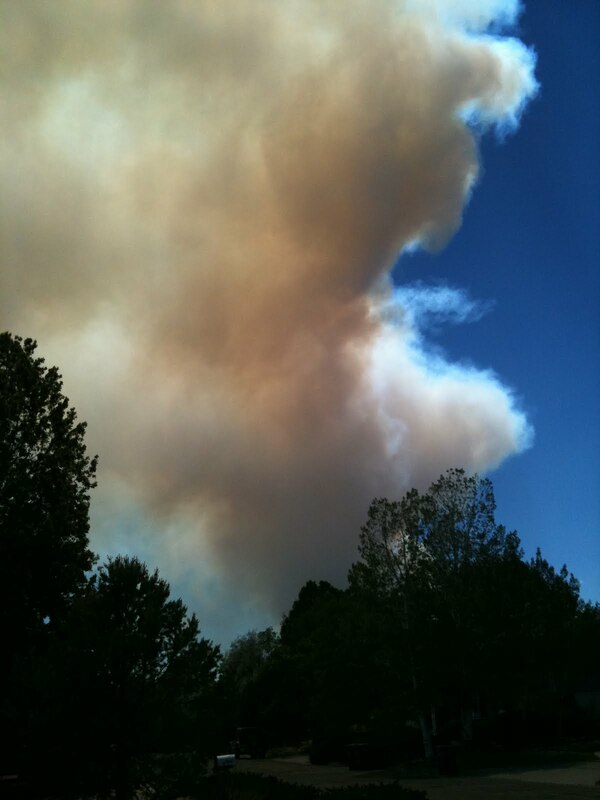 As we came into town, we were struck by the smoke plume from the Pacheco Canyon fire near Santa Fe, which was visible both from Blake’s Lotaburger in Espanola, where we ate lunch, and from my parent’s deck. 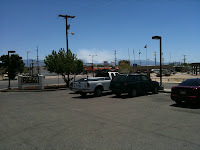 Blake’s parking lot, 24 June 2011. My dad is 67 and has respiratory issues due to a congenital defect which has affected him for several years now. He is far from inactive; the house they lived in, where I lived from 6th grade until I graduated from high school, was built by his bare hands. While the basic structure and layout shows the expertise of a seasoned architect and engineer—the house is effectively heated by a single wood-burning stove, and cooled by an attic fan which pulls the cool night air—the details are the work of an artist. The retaining walls, front steps and back patio are incredible works of masonry, crafted from flagstone my dad meticulously unearthed from Abiquiú using a white 1968 Chevy pickup and a crowbar (not to mention one of the few legally purchased licenses for doing so). The cabinet work, french doors, stairway, banisters and newel cap are intricately crafted and exquisitely beautiful. He dug the first foundation trenches with a shovel back in 1985 and is currently working on cabinet work in the main bathroom. He has often said that he never plans to finish building the house. While the Pacheco Canyon fire hadn’t affected him—the smoke was happily moving away from Los Alamos—the Wallow Fire in Arizona had not been so kind. The smoke caused him to have bronchitis-like symptoms, including terrible fits of coughing. By the time we had arrived, though, he was back to 100%: walking on the treadmill every day (which he does while wearing oxygen), and able to enjoy his four extremely active grandkids. Andrea and I attended a cocktail hour at a casino resort south of Pojoaque on Friday night as part of the reunion, and went to have dinner at Gabriel’s with a few close friends afterwards. 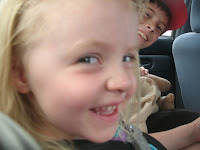 On Saturday, Andrea, the kids and I went to Urban Park for a family reunion barbeque and had a wonderful time. After the barbeque, Andrea packed to head back up to Greeley, since she had to work during the week. Our plan was for me to stay with the kids at my parents’ house until Wednesday or Thursday so we could soak up as much grandparent time as we could, since we are moving to Ohio on August 1st. 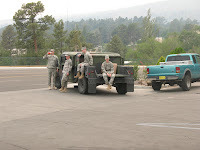 We were then all going to meet up at my in-law’s house north of Antonito, Colorado and stay there through their annual Independence Day celebration on Saturday, July 2nd. When we had gotten home from the barbeque, my mom had set up a kiddie pool on the back patio and was waiting to borrow our pump to inflate it. We ended up deciding to pass on it for a little while, since the kids had been outside all day and playing hard. I figured since we had until Wednesday, there would be plenty of time for swimming over the next few days. My mom had planned several activities: we would have a picnic lunch at Ashley Pond where we could feed the ducks, we could work on crafts that she had gotten for the kids to do at house, and my dad would treat everyone to dinner at The Hill Diner one night. With the kids worn out from playing outside, we opted instead to watch a movie in my parents’ living room. Andrea and I also had a chance to tour our neighbor’s new kitchen. Tom Hornsby, my dad’s best friend and neighbor to the north, is a retired lawyer and has fostered a love of photography and gourmet cooking for years. Their house had a very small kitchen, and my dad had finally convinced him to remodel the upper floor of his home to add a large, gourmet kitchen. The near-final product was impressive, to be sure… incredible granite countertops, beautiful tiled floors, and so forth. Hornsby was very proud to show it off, and he had every reason to be; he had been working incredibly hard on it for a long time, and his efforts were paying off richly. Another interesting aspect of the trip was that we brought both of our cars—our Dodge Grand Caravan and Buick Skylark—to be given a good once-over by Andrea’s brother Neil, who is a mechanic in Alamosa. On the trip down, we left the Buick in Alamosa and took the van and one of my in-laws’ many vehicles down to Los Alamos. By Saturday, Neil was actually done with the Buick, so Andrea took the van back up to Alamosa and swapped cars with Neil, taking the Buick back up to Greeley. That left us with my in-laws’ car in Los Alamos, which wouldn’t actually fit all four car-seats, but we figured we’d split the kids between two cars whenever we needed to go somewhere in Los Alamos, and then Andrea would come back down to Los Alamos with another vehicle to cart the whole family (and all our luggage) back up north. Friday and Saturday nights at my parents’ home in Los Alamos were swelteringly hot, at least compared to our air-conditioned home in Greeley. We all had fans on us, though, and by morning the cool air had cooled us off enough to make us turn off the fans and crawl under the sheets. Fortunately, the dry air was inhospitable for bugs, so the unscreened windows and doors could be left open, and the attic fan kept a nice breeze moving through the house. The dryness gave the kids a few nosebleeds, but my mom added a humidifier to the mix and that stopped them. The kids and I attended church with my parents Sunday morning, where a very proud grandma and grandpa were able to show off their four grandkids to people who had only ever seen pictures. We stayed for a while afterward to fellowship with friends, friend’s parents and former teachers. We got home, changed out of our church clothes, and relaxed for a short time before my dad realized that the refrigerator’s ice maker wasn’t keeping up with the added demand (I’ll admit it… I go through a LOT of ice) and so he should run to Smith’s and get a bag of ice. It was Jayden’s turn to go with Grandpa in the truck… the kids love to drive in his truck, partially because they get his undivided attention and partly because they get to be in the front seat (of course, in a small pickup like my dad’s, it’s the only seat). So off they went, and the rest of us stayed at the house where the kids were alternating between working on the crafts my mom had gotten and playing outside. It was as we were relaxing there that Hornsby came in through the back door, somewhat panicked. 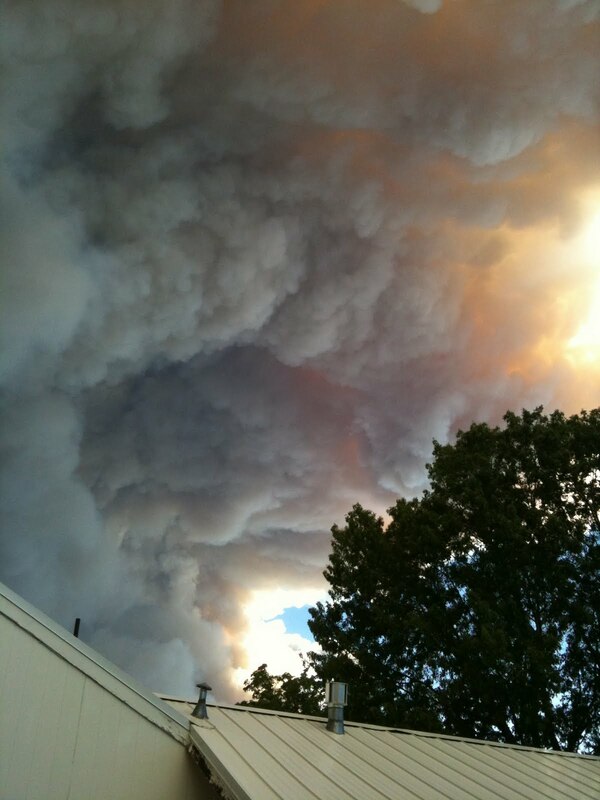 The concern in his voice was not for himself, but for my dad, who he knew would be affected by the smoke. Smoke in the air meant that we would not be able to run the attic fan, and that we would need to close up the house at night, cutting off any air circulation through the house. It was going to be a hot, hot night. parent’s front yard at about 2:15 pm on Sunday. Hornsby had been out on a walk around the neighborhood and had seen the smoke plume from the southwest, and so we all went out to look. It was ugly and it was close. My dad and Jayden came back and, as we suspected, they were well aware of the situation… in fact, my Dad had seen the plume of smoke as he pulled out of the driveway when they were leaving, and though he hoped it was a regular cloud, he knew deep down that it wasn’t. hour later (3:15 pm on Sunday). We spent the rest of the evening watching the smoke move above us. Everything outside took on a yellowish glow as the sun shone through the smoke, but the air remained clear and we couldn’t smell any smoke, so we left the doors open to try to keep the house cool. We kept an eye on the television news out of Albuquerque, and the more up-to-date information and rumors on Facebook and Twitter, and the more official but less frequent updates elsewhere on the internet. From there we learned that a voluntary evacuation of Los Alamos County had been initiated; my parents agreed that they would stay until there was a stronger reason to leave, since the most likely issues would continue to be smoke, which they could manage. 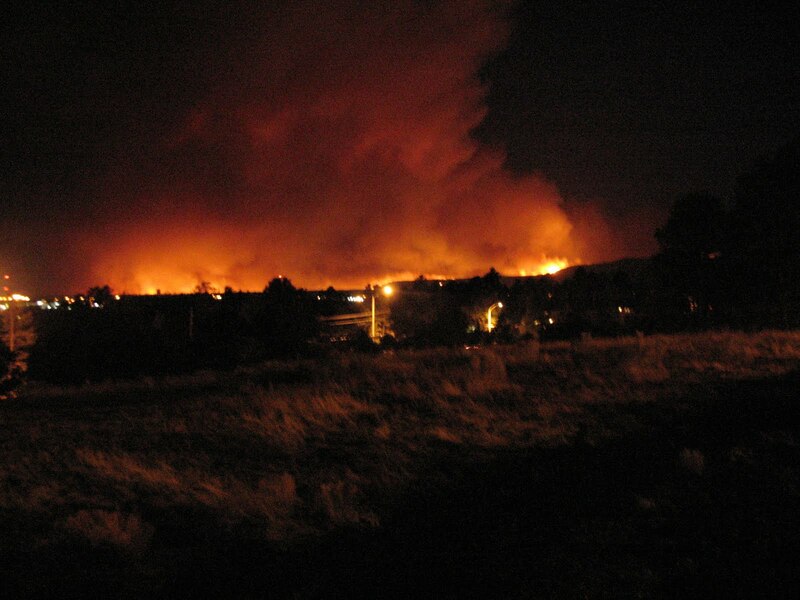 Because the fire, now named the Las Conchas Wildfire, was burning on the other side of the areas that had been burned eleven years previously by the Cerro Grande fire, there didn’t seem to be any threat of the fire entering the townsite as it tragically had done in 2000.
looking southwest on Sunday night, 26 June 2011. After getting the kids to bed, I drove up to the Middle School, which sits on the highest part of the mesa, and from there I could see the fire peeking over the crest of the mountains in a few spots to the southwest. The entire horizon from the southwest to the south was glowing orange, but one of the many other onlookers there mentioned that it was difficult to distinguish between the glow of the fire and the glow of the sodium lights that illuminate the lab buildings that stretch across the southern horizon. I took several pictures and movies with both my digital camera and my iPhone, trying to find a happy medium between slow shutter speed and clear pictures, and then headed home to upload what I could to Facebook. The fire had reached 3500 acres at that time, and at that point it was our understanding that the firefight was still being organized, and no one was actually fighting it yet. Thanks to the smoky sky blocking the sun all afternoon, the night was actually much more comfortable than we expected it to be. We all slept through the night—no nosebleeds—even with the house all closed up. When I woke up, the house was opened up and fresh morning air was pouring in the open windows with the still slightly-orange sunlight. The smoke had gone from a fairly well-defined plume to a much more nebulous haze that covered the southeast half of the sky. 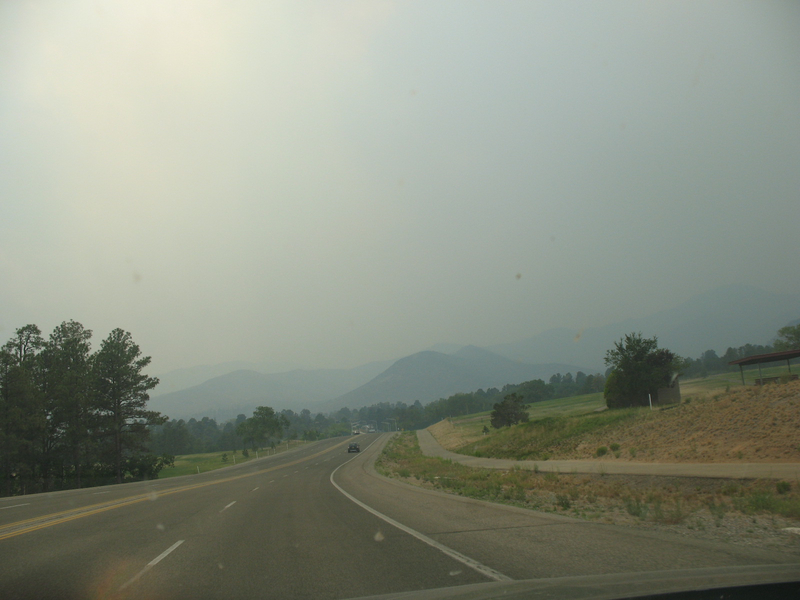 It seemed as if the smoke was rising up from the Jemez, flying over Los Alamos, and descending into the valley upon Espanola and the surrounding communities. The smoke from the Pacheco Canyon fire was no longer visible, as the whole valley to the east was covered with a light brown haze. But the air was clear at ground level, and we were enjoying it. The bad news was the official word about the size of the fire: almost 44,000 acres. I assumed at first that it must have been a typo… that someone had intended to type 4,897 and inadvertently typed 43,897. But as the morning progressed, we listened to KRSN over the internet and watched local news in between Noah’s Wii games, and it soon became apparent that it was not, in fact, an error… the fire had grown to more than ten times its size overnight. The air outside did not portray the threat that the news was bringing us, but we were confident that the Cerro Grande burn area would protect the townsite from harm, that the worst possibility was the prospect of the smoke descending upon townsite. My dad did a load of laundry, as he does every Monday morning, and I followed him with one of my own; he dried his clothes on the clothesline on the deck outside, and when my washing machine load was done I decided to throw it in the dryer (the “machine that slowly turns shirts into lint,” according to my dad) rather than wait for access to the clothesline. When I came back downstairs, the smell of smoke was very obvious, and my mom was closing up the house. For whatever reason—wind direction change, flare-ups closer to town, I don’t know—the smoke had indeed descended upon us, and it smelled like we were sitting downwind of a campfire. Really, without the context of my dad’s health problems, I would have enjoyed the smell. I was disappointed also because I was just going to let the kids ride their scooters in the street—something that they don’t get to do at home because we live on a busier street. But the smoke meant we would need to keep them inside; Owen and Noah have both had problems with juvenile asthma and the smoke, combined with the high energy that would come with riding their scooters, would have not been good for them. My other plan, to inflate the kiddie pool, was also not an option, so we once again hung out inside. We made quesadillas for them for lunch, and my mom had pulled out chicken breasts to thaw out for dinner. We had KRSN on my mom’s laptop in the kitchen, but it had faded into the background as we played games on the Wii and my mom’s desktop in the living room. 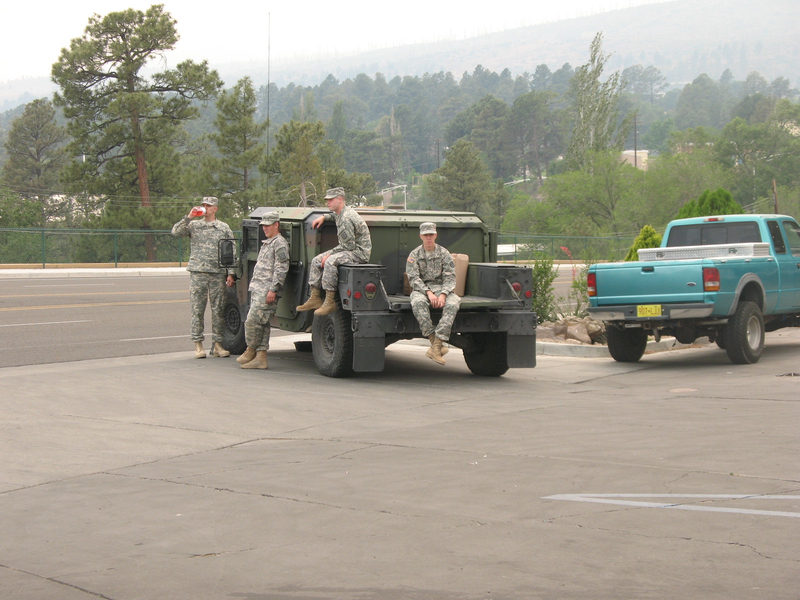 So we didn’t hear the news until Hornsby called us to let us know: a mandatory evacuation of Los Alamos. The evacuation would begin with the western area of the townsite, with North Mesa and Barranca Mesa evacuating last. The evacuation would be managed via the reverse 911 system, and we on the mesas would leave via Rendija Canyon road. My parents and I went upstairs with an urgency covered by a calmness for the benefit of the kids, and started packing. The dryer had finished, so I quickly folded our clothes and got them packed in our large suitcase. My parents finished packing their suitcases before I did, and began getting helping the kids gather their toys. The phone rang twice more; the first was one of my parent’s friends asking about their status, and the second was the expected reverse 911 announcement. We put the packed suitcases in the garage with the large garage doors closed, waiting until everything was in the garage before closing the inner door and opening the outer door. As I was checking through the bathroom for toiletry items to pack, I heard a PA system out front, but all I caught from the message was “mandatory evacuation.” Hornsby told us afterward that we were to use Main Hill road after all, and not Rendija Canyon. I remember hearing from someone that a car had stalled on Rendija Canyon, though I don’t remember who it was who said it. As we were loading the luggage into my parent’s and in-laws’ cars, Owen was worried because he couldn’t find one of his Hot Wheels cars that he had brought with him. Noah said he thought he knew where it was, and so we send them back in the house to look for it. They did not find it (my guess is that was likely already packed somewhere) and Owen in a tearful panic: “I don’t want my car to get burned up,” he lamented between heavy sobs. Jayden and Noah were also in tears, having failed to find the car. I gave each of them a hug and explained that Grandma and Grandpa had done this before—they were evacuated for a week during the Cerro Grande fire in 2000—and assured them that their house would be just fine. I buckled them in and finished packing as ash fell from the menacing brown sky. Because I could not fit all four kids and all the luggage into one car, Noah (the only one who had not had a turn to ride in Grandpa’s truck) rode with my parents in my Mom’s sedan, along with a few bits of luggage and their unused scooters. Our plan was to head up to Andrea’s parents house north of Antonito, where my in-laws had extended an invitation for my parents to stay as long as they wanted. I knew that my parents, who always felt uncomfortable imposing on others like that, would politely decline the invitation, but we didn’t take the time to work it out. With the cars packed, the chicken put back in the fridge, the doors closed up, and the house’s fire insurance policy in hand, we closed the garage door and headed off the mesa. 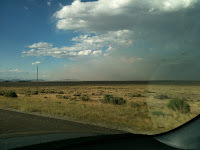 The smoke became most evident as we followed San Ildefonso as it curled down east of the golf course; the usual view from this stretch of road lets you see over the golf course and up into the mountains; the features were somewhat visible but considerably clouded by the brown smoke. Traffic was very light; at this point we were the only two cars on the road. Stationed at the roundabout at the bottom of the hill were several police officers, who appeared to be blocking access to North Mesa Road, and allowing people to Barranca Mesa only with approval. I figured that they were making sure people weren’t going to Barranca Mesa in an effort to use Rendija Canyon; the people they were letting through were probably residents of the mesa returning to gather their things. emerging from the smoke in the distance. 27 June 2011. Driving down Diamond Drive by the golf course slowly brought LA mountain into view through the haze. I had realized the night before that my in-laws car had less than a quarter of a tank of gas, and I had thought about being a good boy scout (“Be prepared”) and filling it up the previous night just in case, but decided that with the voluntary evacuation in effect—I overheard others at the middle school saying they were going home to pack—that there would probably be long lines at the gas stations. Now, with the mandatory evacuation taking place, I realized that would have to deal with the lines after all, and made plans before we left to stop at the top of Conoco Hill to see if getting gas would be realistic. As we crest the hill, I was very happy to see that the gas station had only a few cars, and so I pulled up and—on the third attempt at figuring out which side the gas tank was on—filled up. A national guard humvee was stationed there with several service men in grey camo sitting in the bed and standing nearby. Yes, I paid for the gas. Conoco Hill, 27 June 2011. We proceeded down Diamond Drive and as we neared the high school, portable LED signs identified the two evacuation routes: Main Hill Road and the Truck Route. Canyon Drive was closed, and so Main Hill traffic was directed into the left lane to turn on to Trinity; the right lane was for the Truck route. All the road construction equipment that had been scattered across Diamond Drive by the High School was parked in the lot by Sullivan Field, and it was at about this time that traffic started to slow. We were not at a standstill, but traffic was certainly getting thick, and we were moving at around five or ten miles an hour. There were people in orange and yellow vests standing between the two southbound lanes directing traffic through; they were not uniformed officials, and I guessed that they were likely construction company employees who had been pressed into service through the construction area. The stoplights were working as usual, but at Canyon and Trinity there were police officers directing traffic through, ensuring that the cars moved on through on the evacuation route regardless of the traffic signals. There was an occasional car in the single oncoming lane, and the drivers always had a concerned and determined look on their face as they no doubt raced home to get their stuff. After turning onto Trinity, the real slowdown occurred, with cars choosing between the two lanes available to them. 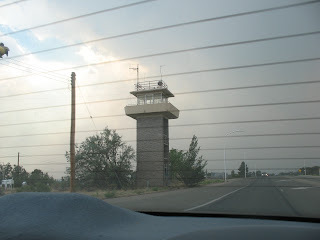 The other interesting feature was the National Guard units posted at nearly every intersection. Twice we saw emergency vehicles—an ambulance and a fire engine—pass us in the oncoming lane; for one of these, we were at the intersection of Trinity and Oppenheimer, and the people stationed at that intersection hurriedly directed a car coming the opposite direction off to the side so the ambulance could pass. Every business we passed was obviously closed, including the gas station at Conoco Hill (fortunately for us the pumps were still turned on and accepting credit card payments). As we passed the police office we saw a slightly larger contingent of National Guard members and vehicles. The ducks—or at least some ducks—were still at Ashley Pond, sitting in the grass on the Trinity side of the water. At one point we saw a helicopter in the sky to the north of us; my guess is that it was either a news chopper or some sort of governmental tour of things, since it did not seem to have the weight or size of one of the larger fire responders. whole series on my Facebook photos page. I tuned the car radio to KRSN but was dismayed to hear only static; either they were not broadcasting via AM or there was some aspect of the car’s radio that I didn’t understand how to operate. I had given the camera to the kids and invited them to take as many pictures as they wanted; In addition to some kids-eye-view images of the skies and buildings around us, they ended up taking some cute pictures of siblings, feet, and Hannah Montana stickers. The traffic was stop-and-go until the lanes merged together at the southeast corner of the Mari-Mac shopping center, by DP road. Interestingly enough, after merging into one lane, traffic sped up considerably; so much that we were traveling at or near the speed limit for the rest of the trip out of town. There was a line of news vans across the road from the airport. As we descended Main Hill road, the skies in front of us were clear, and the few glimpses of the sky behind us were the opposite; I almost envied the few souls who were driving in the opposite direction for their panoramic view of the entire situation. My mom has trouble if she eats too late in the evening, and since it was 4:30 when we got to Espanola, we stopped at McDonald’s to eat. The kids wanted so badly to play on the outdoor playland, but we needed to get on the road again, and it was actually windy and a little smoky outside. Ironically enough, as we ate our food, it began to rain… but then stopped after about thirty seconds. Colorado border, looking northeast, 27 June 2011. 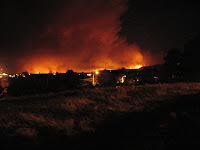 We made it to Antonito around 7:00, and even there we could see the smoke, which stretched from the south to a point that was almost due east. The mosquitoes were very bad at my in-laws’, so we quickly unloaded the cars. My parents and I exchanged regret for what was supposed to be such a fun time in Los Alamos. We promised to save our plans for the next time, whenever that will be. It’s a long way from Ohio, but I have every intention of making the trip as often as we can. 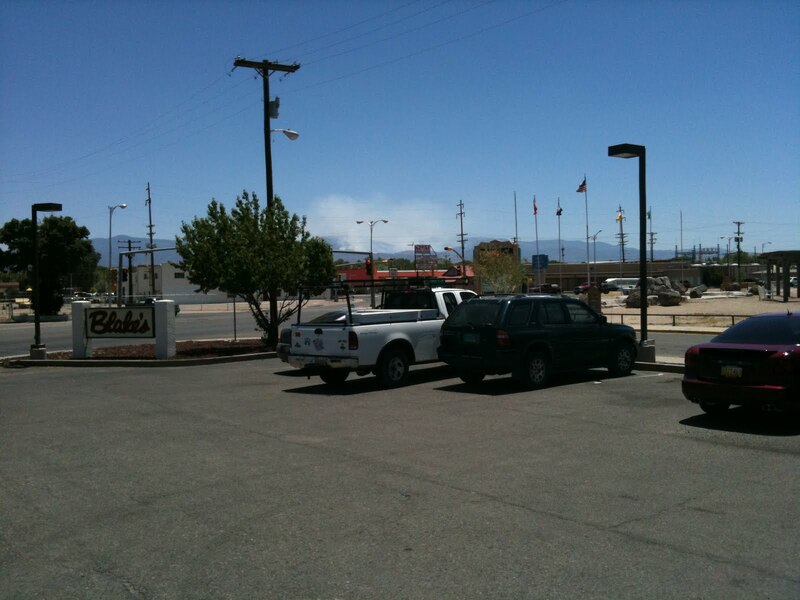 They got back in the car and drove off, heading north to stay in a motel in Alamosa for the night. My dad said they wanted to drive around to the various towns in the area, sight-seeing and “motel-hopping” until the evacuation order is lifted. That was about twenty-four hours ago. My in-laws are both working, since they weren’t expecting visitors until Thursday, and so I’ve been sitting around listening to KRSN and combing Facebook for updates all day while the kids have been playing with the wealth of toys and video games here. According to the various news reports I’ve heard, Los Alamos remains safe; the fire threatened the Pajarito ski area but the firefighters have been successful in protecting everything in the area. There is no way to know how the winds may shift, and if the Cerro Grande fire is any indication, there are no guarantees until the fire is put out, but things are looking positive at the moment. Andrea will be here tomorrow evening, and we’re looking forward to a fun weekend celebration. After that we’ll head back up to Greeley and resume packing for Ohio. My parents called a while ago and said they are heading to Santa Rosa for the evening. I know that they would rather be home, but the latest reports seem to indicate that it may not happen until the end of the week. I won’t be able to be there with them then, but like 10,000 others, I hope to return to Los Alamos soon.